Scoopie Jess will make his first start at Los Alamitos since running fifth to AQHA champion 2-year-old J Fire Up in the Grade 1 Los Alamitos Two Million Futurity last year. LOS ALAMITOS, CA—NOVEMBER 8, 2018—Two Feather Series LLC's Scoopie Jess will make his first start at Los Alamitos since running fifth to AQHA champion 2-year-old J Fire Up in the Grade 1 Los Alamitos Two Million Futurity last year when he's one of eight runners in the $25,000 Town Policy Handicap for 3-year-olds at 400 yards on Saturday at Los Alamitos. To be ridden by Cesar De Alba for trainer Bret Vickery, Scoopie Jess will make his 2018 local debut after a four-race stint at Ruidoso Downs in New Mexico. While there, the gelding by One Sweet Jess won his trial to the Grade 1 All American Derby at 440 yards and was third in his Grade 1 Rainbow Derby to eventual Rainbow runner-up Hes Limitless. 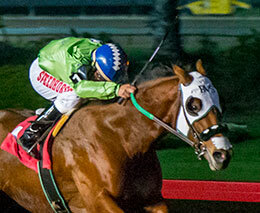 Scoopie Jess also competed in the $100,000 First Down Dash Stakes at Ruidoso. Scoopie Jess' last six starts have all been at either 400 or 400 yards and he should love the 400-yard distance in the Town Policy. He'll start from post two. Similarly to Scoopie Jess, Howard Nichols' La Rusa has been racing at 400 yards exclusively in her last seven starts. The Walk Thru Fire filly, who will start from post number four in the Town Policy, won her Los Alamitos Two Million trial at 400 yards last year and most recently finished second by a nose in her trial to the Grade 1 Los Alamitos Super Derby. She figures to be in the thick of the action in the Town Policy. The field will feature Lazy Creek Ranch and Jerry McAlevey's multiple stakes finalist On Our Way, who shared the starting gate with Scoopie Jess in last year's Los Alamitos Two Million. Also sired by One Sweet jess, the Steve Burns-bred filly won the Four Forty Blast Handicap in mid-August and most recently qualified and then raced in the PCQHRA Breeders Derby final. Cruz Mendez will pilot her from post seven. Two-time graded derby finalist Twenty One Gunz, Governor's Cup Derby finalist My Favorite Cartel, 2017 Grade 1 finalist Famous N Hot, La Primera Del Ano Derby finalist Splendid Cause, and Los Alamitos Maiden Stakes finalist AR Royal Blue will also race.